This past week I had the pleasure of fishing with Dan Moats and Tony Hernandez. Dan is the owner of Spanky Baits and legendary Grandma Lures. Tony is a very experienced and serious musky hunter. It was a pleasure to share a boat with this much knowledge and this much experience. We all learned off of each other. What I learned most was that both of my fishing partners were class acts with a passion to hunt that is as big as anybody’s. We caught some very nice muskies and would have caught more if it wasn’t for the lightning and my whining when there was lightning in the area. Here is Tony with his first ever Ottawa River musky. In the ‘pig’ pick I get to be the guy holding the porker. She ate a Spanky on the first turn at the side of the boat. 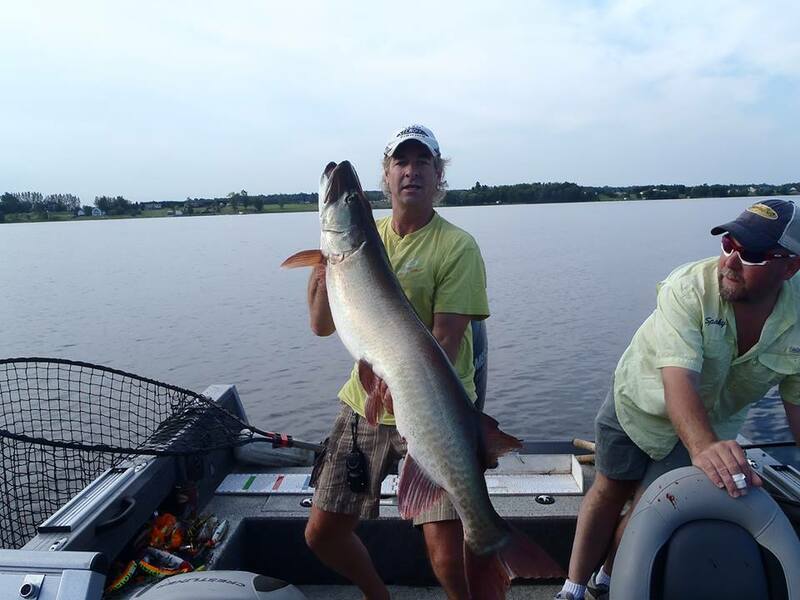 For anyone who doesn’t musky fish, one of the greatest things that can ever happen to you in fresh water fishing is being able to turn a fish a couple of times at the side of the boat through proper bait movement and coerce a bone-crushing strike right at your feet. Got lucky on this one and got to watch it all. Wow!